PA / PA Wire/Press Association ImagesMichael Sherwood, Vice Chairman at Goldman Sachs, appears before the Business, Innovation and Skills Committee at Portcullis House in London, on the collapse of BHS. 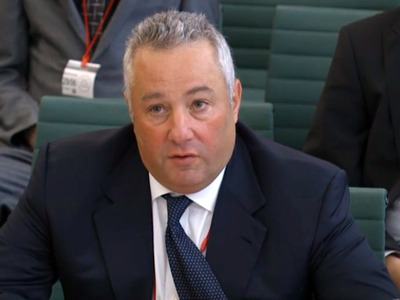 One of Goldman Sachs top European bankers told MPs on Wednesday he won’t take any blame for the collapse of BHS earlier this year, which will likely put 11,000 Brits out of work and leaves an estimated pension blackhole of £275 million. Goldman Sachs acted as informal advisors to Sir Philip Green last year, advising the retail billionaire on the sale of BHS to Dominic Chappell. Chappell, a twice bankrupt former racing driver with no retail experience, ran the chain until its collapse in April. Gutman, Michael Sherwood, the co-head of the bank in Europe, and banker Michael Casey were all recalled to the inquiry on Wednesday to answer questions on the advice Goldman gave during the transaction. Sherwood was grilled closely by MPs, beginning by apologising for the late submission of a piece of evidence. He said that Goldman “absolutely had no idea at the time who the buyer was” when the bank turned down working formally on the bid. MPs accused the bank of a “dereliction of duty.” But Sherwood refused to take any blame for BHS’ eventual collapse saying Goldman Sachs “absolutely do not accept blame” when asked by MPs. But Sherwood said he “regretted” not formalising the bank’s role more, saying if he had more documentation he could have avoided much of the controversy that has surrounded the sale.